Fast RMX is the first arcade racer on the Nintendo Switch. 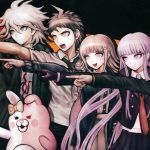 It’s a blazing-fast thrill-ride which borrows heavily from 2 classic franchises; however, it sports a personality of its own that helps it stand tall as a Nintendo Switch launch title. It’s a strong addition to the currently-limited Switch library and, while it’s not going to win any awards, it’s shouldn’t be overlooked. 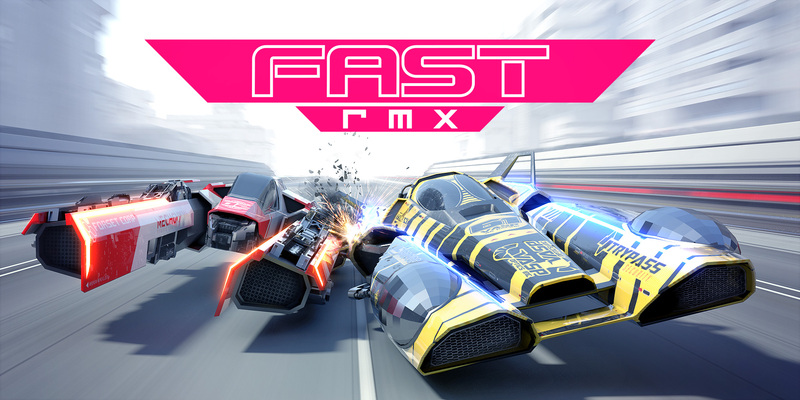 Fast RMX is essentially an arcade-style racer which puts you in control of 1 of a possible 15 anti-gravity vehicles in the same vein as the ships seen in the highly-acclaimed Wipeout series. In your super-slick hyper-speed hover car, you pierce through the air at breakneck speeds in unique race courses collecting floating orbs to fill your boost gauge and speeding over blue or orange sections of the track to automatically gain a boost of incredible speed. 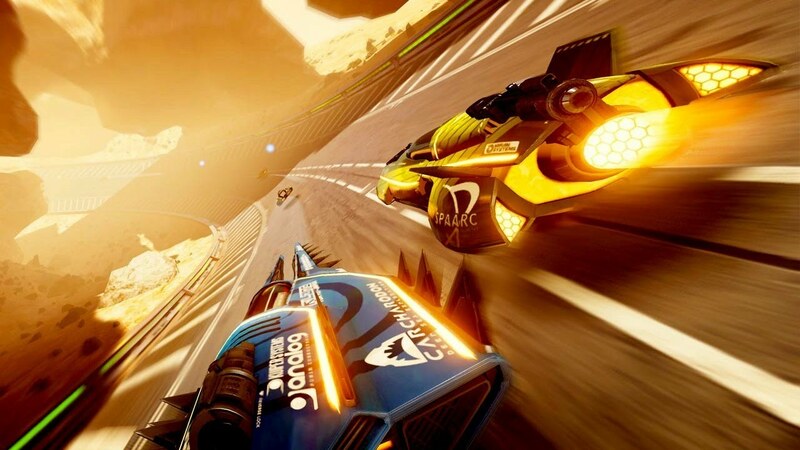 The key feature which sets Fast RMX apart from the titles it clearly borrows from, such as Wipeout and F-Zero, is your vehicle’s ability to phase to blue or orange colours which is required to hit the correct coloured boosting sections of the track. Zooming over a blue section whilst in orange phase will cause you to slow down significantly, which is bad because the AI competitors are never far behind, meaning messing up even a small fraction could easily cost you a few positions. 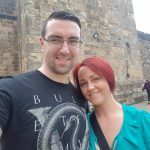 A huge missed opportunity are the jumps. Fast RMX’s gut-wrenching speeds result in huge air when hitting the many jumps; however, there’s nothing to do other than hit the landing. I would have liked to do some tricks or spins in the air but, unfortunately, it’s not possible. Fast RMX has 11 cups to play through in its single-player element, and as you tackle through each one, more tracks and vehicles become available. The key to success is boosting smartly, not just boosting every time you fill your meter, because the AI is brutally tough and never far away from your rear bumper. Hitting the sides of the tracks can be costly too, but you can take sharper turns using the trigger button; this causes your vehicle to tilt left or right, respectively, to help tackle those pesky S-bends. Every one of the 30 tracks twist and turn relentlessly and without warning make it feel like a messed up vomit-inducing rollercoaster ride, and each one provides an exhilarating experience. The soundtrack helps in this respect too. Each track is accompanied by fast, pumping techno beats that assist in keeping that blood pumping. Even starting up the game greets you with a cracking tune to get you in the mood. Fast RMX is a gorgeous looking game. The Nintendo Switch handles its devilishly quick pacing brilliantly without a single drop in frame-rate or graphical fidelity. Then there are the slick weather effects. Hurtling down an oversized toboggan track in the pouring down rain is tremendous fun and a true feast for the eyes. Fast RMX excels in its visuals. Futuristic utopias mixed with urban and tropical locations allow for bright and bold colours to fill the screen, and regardless of whether you play on your television or if you pull your sparkly new Switch from its dock, it looks beautiful either way. ‘Hero’ mode is more of a challenge and more akin to the aforementioned mighty F-Zero. It gives you one life as your boost meter also becomes your shields. You must decide to compromise shields to gain more ground or save them for more protection from walls. ‘Hero’ mode is for the veterans for sure, players who have honed their skills and mastered the tracks enough to avoid collisions, as your destruction means starting all over again. 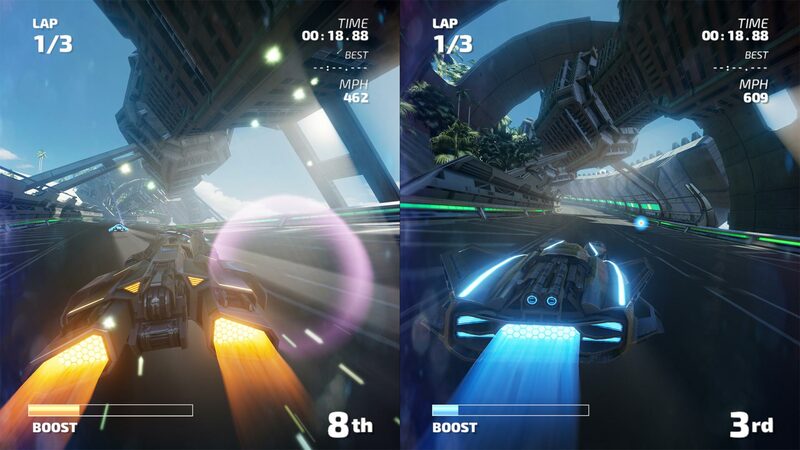 There is a multiplayer element in Fast RMX, but to play with friends you’ll have to play via split screen. There is no active way to search for your friends online. In fact, the entire multiplayer suite is very bare. There is no lobby system, no leveling up or any sort of progression, no special trophies to earn, nothing, you simply race then vote for the next track. Very disappointing. Split screen fares a little better enabling up to 4 people to race simultaneously, but without any sort of weaponry, the competition relies on your pals messing up. Overall, Fast RMX is a great space filler for your arcade racing needs, but it sure has some shortcomings. Great visuals, a solid 60 frames-per-second at lightning speed and a pumping soundtrack will certainly help fill that void, but if you want to play with others, there are better launch titles that will satisfy.